Tata has been refreshing its high selling Tata Indica for many years in many different avatars. Most popularly seen in form of Taxis and commercial cars because of spacious Interiors, boot and fuel economy, Tata Indica has brought a lot sales to Tata in past years. Changing its focus more towards the personal vehicle customers, Tata introduces Tata Indica Vista or simply Tata Vista was introduced by Tata in New Delhi Auto Expo of year 2008. Since then, it has improved the image of India car among the car buyers. Continuing it further, Tata is going to launch a cosmetically upgraded version of Tata Vista in August 2011 (most likely on 15th August 2011). The new Vista gets larger Headlamps and grille which resemble the new Tata Indigo Manza. 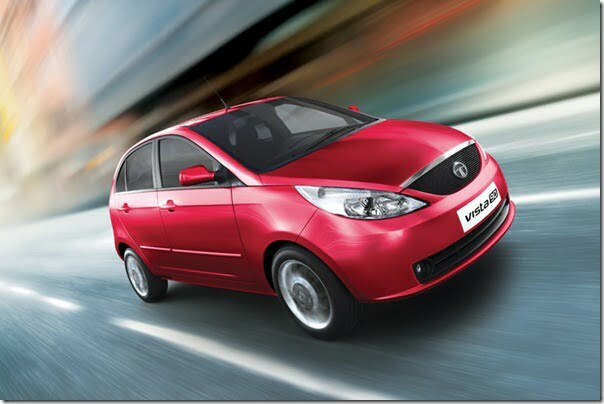 It will give a more aggressive and larger look to the Tata Vista compared to the present variant. Apart from the front headlamps, bumpers, grill and front fascia in total, it will also get cosmetic upgrades at the rear bumper which will make it look better. With the design cues from Manza, new Vista will be upgraded in small nooks and corners on the car. Also the quality of the interiors, plastics etc. is also expected to be improved as Tata cars are not known for high quality of interiors, so with new Vista, Tata may like to improve upon the interior aspect of its cars. The Engine options, transmission options and other technical specs remain same with a minor change in length which may happen due to new front and rear bumpers. There is also a minor price change expected with the new features and cosmetic make over of the Vista. We will be looking forward to it and will bring the pictures and more details as they are officially revealed. Till the, you can stay tuned to us by liking our official Facebook Page and by signing up for our free email newsletter.